Continuing on with the US Coin Values Advisor series on Sleepers, today's topic is the 1875-CC Twenty Cent piece. As most of you know, a "Sleeper coin" is a term used to describe a coin temporarily priced below its true market value, positioned to someday rise significantly in price to properly realign (or establish) itself in relation to its scarcity, relative to demand. Many bargain hunter collectors spend their days and nights dreaming of Sleeper coins. To them, happiness is buying a rare coin at a discounted price, just like a Kent is happiness to a smoker [us Baby Boomers get it -- you Gen X'ers and Millennials can click the link or google it!]. The problem most Sleeper coin seekers run in to is how do they know when they've found a coin temporarily depressed in selling price? Without value trend data from the past, the selling price of today cannot be put in historical context. Is it a bargain or not compared to a few years ago? Is now the time to take the plunge or continue waiting? These are all-important perplexing questions. [Going into Dragnet mode now] The story you are about to see is true. The names have not been changed to exalt the innocent. [listen to goose bumpy Dragnet theme] That's where I come in... I wear a badge. 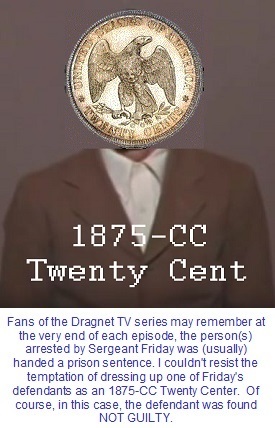 Fortunately, thanks to my many years of numismatic value trend research, I have the scoop on the elusive 1875-CC Twenty Cent coin. [now putting away my Sergeant Joe Friday impersonation -- another Boomer reference. JK about the badge thingy, BTW]. First, a little background information is in order. The most successful collectors, irrespective of how success is defined, take the time to learn the stories [just the facts, ma'am] underlying their coins of interest. The Twenty Cent piece was the shortest-lived denomination in United States numismatics, running from 1875 to 1878. Business strikes were issued in 1875 and 1876 only. Production was limited to Proof examples in 1877 and 1878. Why was this offbeat coin created to begin with? Mint Director Henry Linderman wrote in 1874 that the Twenty Cent coin would help in making change in places where the five cent coins circulated poorly. Others pitched the idea that it made sense that all US coinage moved in parallel x 100 with paper money (i.e. one cent and the one dollar bill, the five cent and the five dollar bill, etc). There was no Twenty Cent coin corresponding with the existing $20 paper bill. Cynical observers may have hit the nail on the head when they countered the Twenty Cent coin was just another political payoff to the silver mining industry. Regardless of the reasoning behind the Twenty Cent coin, it was not well received with the American public. The biggest complaint was its close resemblance to the quarter in both size and appearance, leading to confusion and causing errors in making change. The first year of Twenty Cent coin, 1875, saw a business strike mintage of nearly 1.33 million, of which 87.2% were struck at the San Francisco Mint. A mere 36,910 (plus 2,790 proofs) were produced at Philadelphia. The remaining 133,290 were struck at the Carson City Mint. With little demand and no where to go, the vast majority of the Carson City twenty centers were melted down, thus transforming the surviving 1875-CC population into numismatic rarities. The Mint felt the backlash and scaled back production dramatically in 1876. In 1877 and 1878, striking of the Twenty Cent coin was limited to 950 Proof examples total. Maybe the Twenty Cent coin would've fared better had it not been released during one of the worst economic downturns to plague the United States during the 19th century. Jobs were tough to find throughout much of the 1870's. 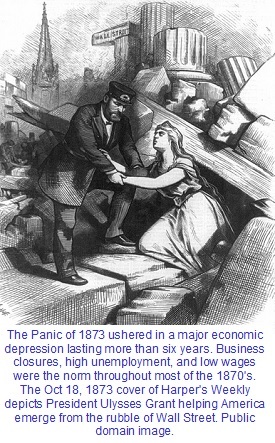 Some of the blame for the misery can be traced back to the Coinage Act of 1873. By the time the nation righted itself economically, the obituary for the Twenty Cent coin had long been written. Despite the inglorious life and quick demise of the Twenty Cent coin, collectors of the 21st century view it with a great deal of reverence. The 1877 and 1878 Proof versions can sell for over $10,000. The 1876-CC is so scarce it has attained legendary status and is worth well into six figures. Of the four remaining business strikes, the 1875-CC by far the most valuable, selling for around $350 in Good-4 condition, upwards to $20,000 in MS-65 Uncirculated. As the above data demonstrates, the 1875-CC Twenty Cent was worth $1.25 in 1950. Today, the same coin retails for about $350. That computes to a 9.06% annual rate of return over a 65 year period, which, as any financial analyst will confirm, is very nice. Many of us don't buy and hold for 65 years, but a similar scenario prevails over a shorter time horizon. Let's say you purchased the 1875-CC in Good condition in 1990 for $50.00. To reach its current price tag of $350, it would have to increase at an annualized rate of 8.09%. Pretty darn good! The impressive record is not limited to the Good condition specimen. The same can be said for the 1875-CC across the grade spectrum. For example, the 1875-CC in Extremely Fine condition was valued at about $8.00 in 1950. It's retail value in 2015 of approximately $1100 translates to an annual percentage increase of 7.87%. 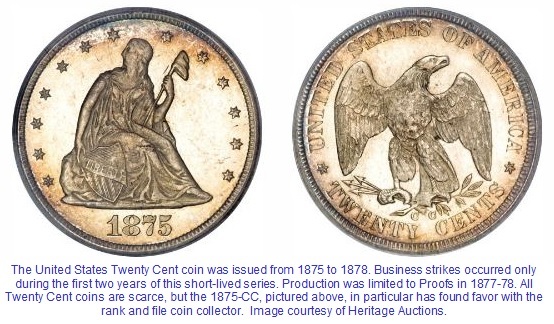 The point of this narrative is to show the 1875-CC Twenty Cent is a favored collectible coin with the numismatic community, and has a long track record of price hikes to prove it. By comparison, common date coins advance in value at a much slower rate, especially if their precious metals influence is removed from the calculation. As popular as the 1875-CC has been, it has dipped in value considerably in recent years. Between 2008 and 2013, the value of a Good-4 example topped out at $425. The same coin can be purchased in 2015 for around $350, at a discount of not quite 20% from its all-time high. A similar priced fluctuation occurred between 1975 and 1985, so this isn't a unique occurrence. The 1875-CC isn't the only rare United States coin that has lost a little bit of steam lately. On the chart below, the red line in an indicator of the overall health of the U.S. rare coin market since the year 2000. It is based on the price movements of 87 representative collectible United States coins, ranging from the half cent to $20 double eagles. In the last year, the market has headed a bit south, though only mildly. We encourage you to read more about our Rare Coin Values Index. 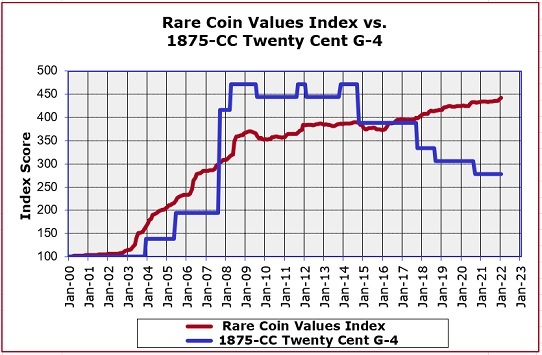 The blue line charts the progress of the 1875-CC Twenty Cent in Good-4 condition over the same time period. From 2000 to 2007, it lagged below the Rare Coin Value Index, but from 2007 to 2014, its score rocketed above the Index. In 2015, it is basically at par with the overall Index. I hope I don't sound too much like a pitchman, but if you've ever thought about adding an 1875-CC Twenty Cent coin to your collection, right now would be a good opportunity to buy at a substantial discount. As the long term pricing history of this elusive coin illustrates, it will once again zoom upward, revealing the 2015 selling price as the bargain it is. As always, buy the best grade you can afford and then be patient; it may take a few years or even a decade before we see the next price escalation (just look at how the price got "stuck" in 1985 and again in 2000). Never buy a rare date like this one from a questionable/unproven source. My advice is to only buy from an established dealer with a long history of customer satisfaction. Furthermore, consider only coins graded/certified by PCGS, NGC, ICG, or ANACS. That will help you (or your heirs) when it is time to sell. Again, I don't want to seem like a pushy salesman, but there is a good selection of 1875-CC Twenty Cent coins available at all times on eBay. This link is coded to isolate examples certified by PCGS, NGC, ICG, and ANACS. Be doubly certain to review feedback ratings of the dealers you're considering. [Disclosure: if you get to eBay from the link above and buy something, I receive a small commission, whoopee!]. There are also a number of highly reputable auction houses that frequently offer the 1875-CC. I can recommend them with a clear conscience. You can read more about them on my "selling coins" page [No, I do NOT receive compensation if you buy through them -- but I get satisfaction knowing you will obtain a worthy coin you'll be proud of]. [Dragnet mode ON] A trial was held in Numismatic Court on Oct 4, 2015. In a moment, the results of that trial. The 1875-CC Twenty Cent was charged with being a popularity fake, but was found NOT GUILTY in the court of collector opinion; the impressive pricing history is based on the fundamentals of scarcity and lasting demand. It is deemed to be one of the best acquisitions a numismatist can make, especially if future value growth is an important consideration.